This was the second hike in a row where I didn't have to drive all the way from home. Instead, our family was at an event near Hebron, Maine, which was only about an hour's drive from Gorham. 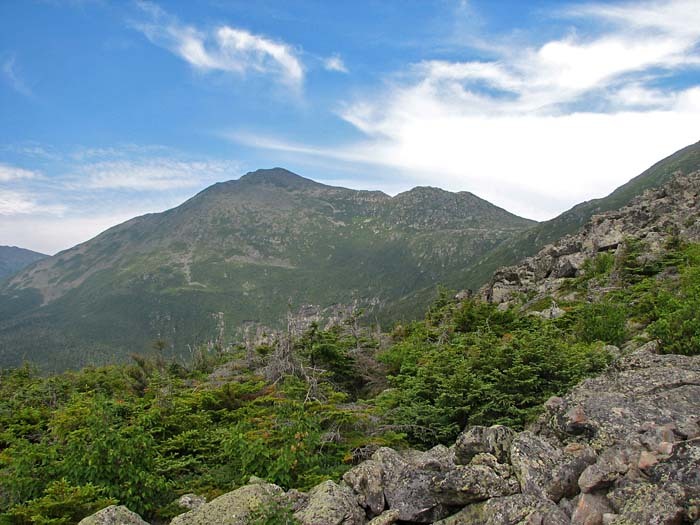 I decided to take Saturday off so Muffin and I could climb Mt Madison, this time, approaching it from the south via the Osgood Trail, and hopefully descending on the Daniel Webster Scout Trail. I'd already been up from Appalachia a number of time, so I wanted to try something different. 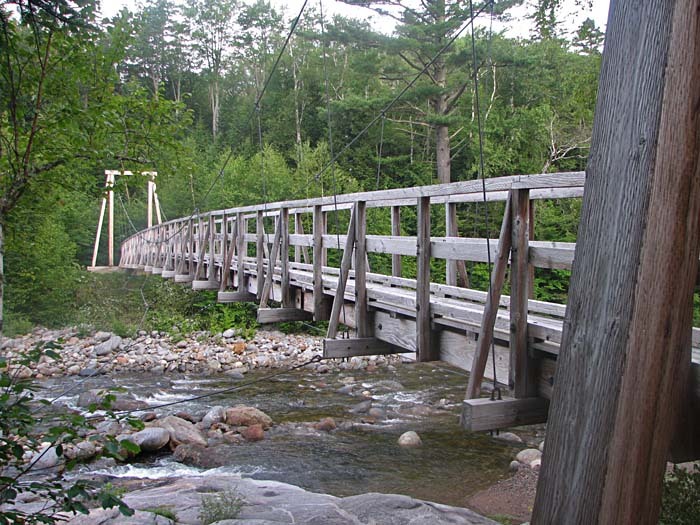 I parked at the Great Gulf Trailhead off Rt 16 in Pinkham Notch, and we got off to a nice early start, immediately crossing the West Branch of the Peadbody River over a suspension bridge and heading off into the depths of the Great Gulf. The trail was fairly flat, so there was plenty of time to warm up before hitting the steep sections higher up. We hiked leisurely along, listening to the babbling of the nearby river and the lively chirping of the birds. 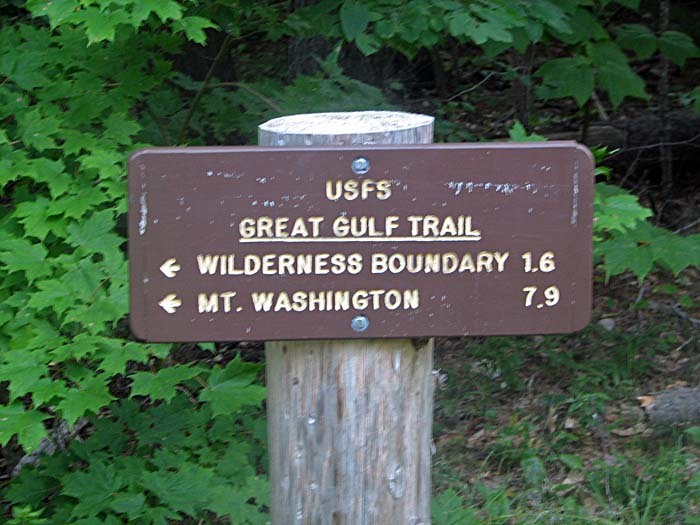 Before long, we crossed the boundary into the Great Gulf Wilderness, and shortly thereafter, reached the junction with the Osgood Trail. We immediately began climbing moderately out of the ravine, the trail becoming gradually steeper as we got higher. At the intersection with the Osgood Cutoff, we reached the Osgood Tentsite. Someone had set up a tent on one of the platforms, and another hiker was still sleeping next to it outside, so we quietly took a look around, then stopped by the nearby spring so I could refill our water bottles. Above the tentsite, the trail continued to climb more steeply, and before long, I expected to break out into the open at any minute. It was a false impression though, and we continued on under the canopy of trees for some time. Finally, not long after huffing and puffing my way up a particularly steep section, I turned around and got a glimpse of the world we had left far below. A few steps further, and we were completely out of the trees. 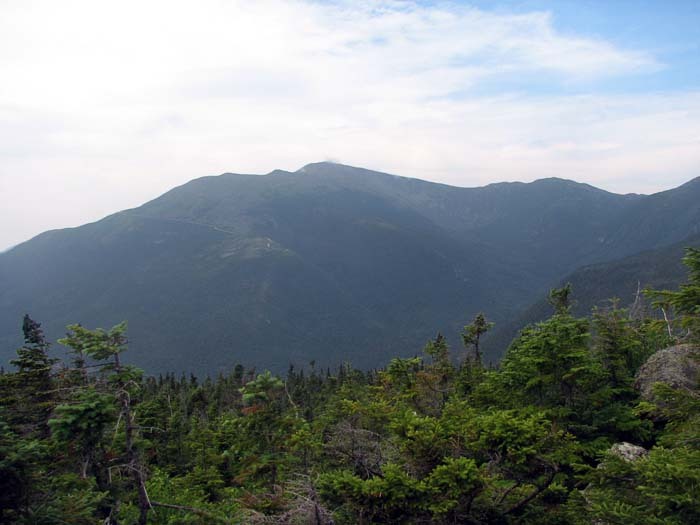 To the southwest, Mt Washington towered over the gulf, the thin line of the Auto Road cutting across it eastern slopes. Ahead, Mts Adams and John Quincy Adams, looked hopelessly distant. When I first hit treeline, I always feel a burst of energy, but this usually fades when I get a good look at the path ahead and notice how far I still have to go. Today was no exception, as the ridge rose steadily in front of us over numerous humps and rocky outcrops before reaching the tiny and far-off summit of Mt Madison. Great Gulf Trailhead. 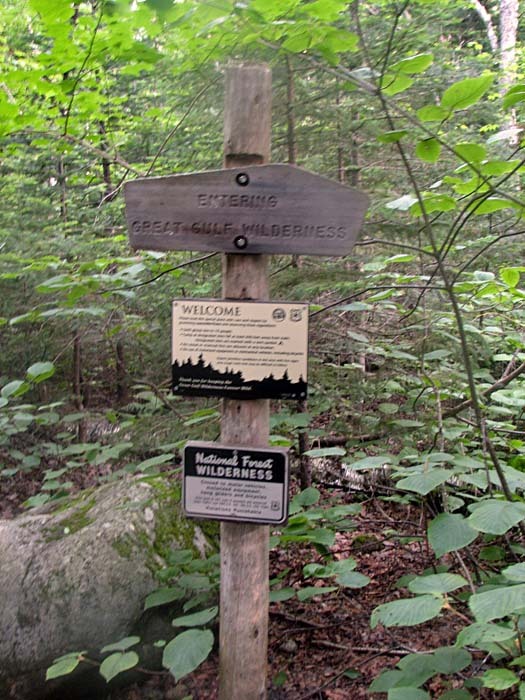 As the sign says, it's 1.6 miles to the Great Gulf Wilderness boundary. Suspension bridge over the Peabody River. The trail crosses the river soon after leaving the parking lot. Muffin on the Great Gulf Trail. We stopped for a short rest here before continuing on. Great Gulf Wilderness Boundary. The Osgood Trail junction is only a short distance beyond this spot. 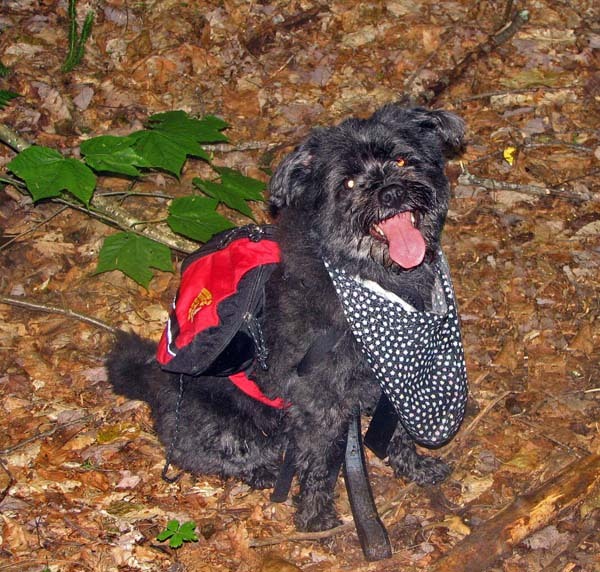 Muffin at the Osgood Tentsite. 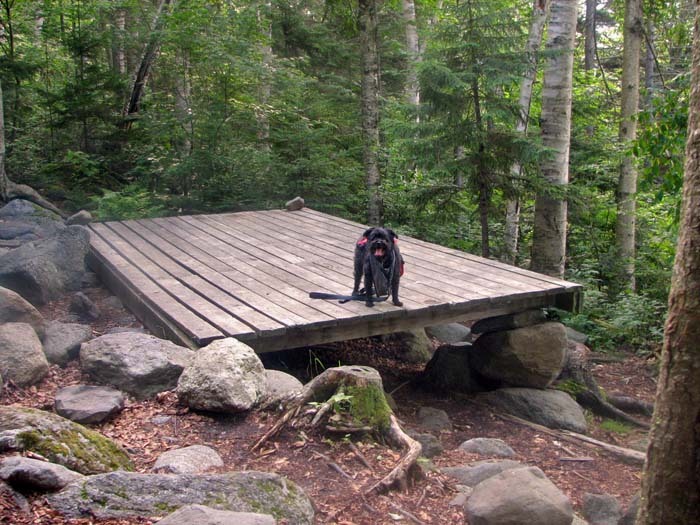 The tentsite is located at the intersection of the Osgood Trail and the Osgood Cutoff, and has several tent platforms. Mt Washington from the Osgood Trail. 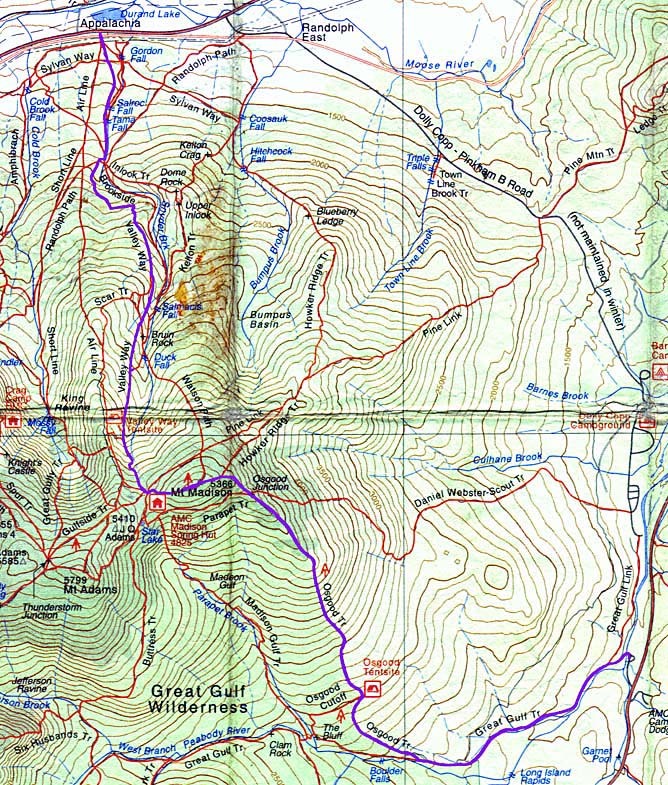 The thin line of the Auto Road is visible cutting across the mountain on the left about a quarter of the way down from the top. Mt Adams from the Osgood Trail. Mt John Quincy Adams is just to its right, and the Osgood Ridge rises up to Mt Madison at the far right.